Can a house be green? You may answer, “A green house is the one that is green in color.” While we would have to agree that a house COLORED green IS a “green” house, today when we talk about a house being green, we mean a house whose performance, rather than appearance is green. A house that is green in performance is a house that responds to local climate conditions, uses passive and active measures to reduce energy use, filters water, grows food and takes advantage of its location setting. Houses of all colors can become more ‘green’ by orienting windows to the south for direct sunlight, insulating or creating thick walls (especially to the north) to keep heat in and cold out, optimizing space and using energy efficient appliances and non toxic, renewable materials. Try a series of activities and green your imagination about houses! Green Homes collect, filter and reuse water. Take a look at rainwater collection to see how a house can collect. 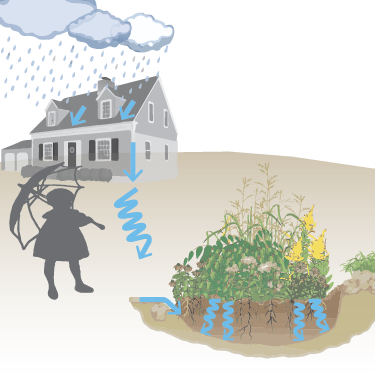 Learn about rain gardens and get a plan of your house or a typical house and map areas suitable for raingardens. Using Google Scribble Maps, plot and locate places for rain collecting water barrels, areas for plant absorbing raingardens. Conserve! Collect! Once you have completed your outdoor water use search, walk inside. Do you have any drippy faucets? If so, they need to be replaced. How about your toilets? How many do you have? Are they low flush or regular? Consider replacing them one by one and saving water. As part of your water system, is your hot water heater constantly heating water for your cup of tea or shower – even when you sleep? If so consider replacing it with an on demand hot water heater that only uses energy to heat water when you need it! 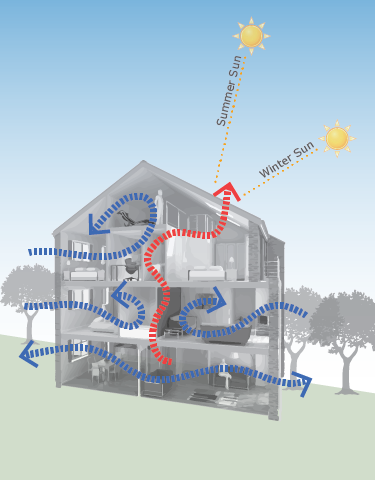 There are passive and active systems that work together to make a house green. Green home passive measures include natural ventilation, natural solar heat and light gain, and water collection and reuse. Green Homes can also make use of geo thermal support for heating and cooling by moving air into the earth to capture its warmth or coolness. The earth below the freezing line or desert surface is a steady 55 degrees. Moving air through tubes in the ground can add a cool 55 degrees toward cooling a house when the outside temperature is 80 and above. 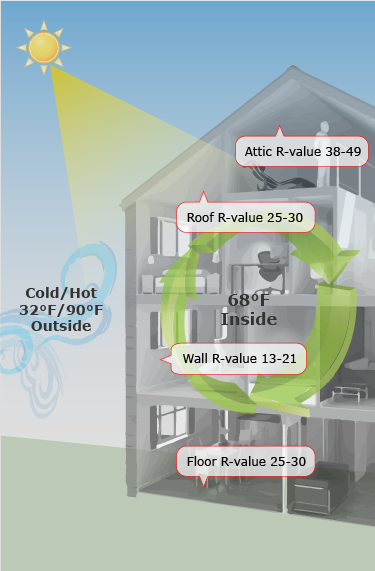 Adding a warm 55 degrees to air that is zero or below can help to supplement heating bills. Placing operable windows on opposite sides of a house, and downstairs and up can create natural hot air rising for ventilation. Adding an attic fan to pull hot air up upwards and out will increase air movement and cooling effect when the air is still. Draw a section of your house and show natural cross ventilation air movement, solar gain or shading (south side) and location of geothermal wells for heating and cooling. Be sure to locate an attic fan in a top floor window! Use natural earth, air and sunlight systems to support your green home! Like vernacular architecture, green homes respond to location and climate. Whether a house is built under, in, on, or on top of the ground depends on temperature, seasons, soils, humidity and air movement. Higher elevations tend to be dryer and lower elevations tend to collect water. Arid homes need to have thick walls and little windows on opposite sides for cross ventilations to keep shaded, cool, and breezy. Humid and hot homes need to be off the ground to keep dry and have cross ventilation to keep cool. Winter houses with lots of freezing weather and snow need to have south facing windows and north facing trees to protect them from cold winds. Roofs where there is rain and snow need to be sloped; roofs where it is hot and dry can be flat. Using Google Scribble Maps locate your house. Print the aerial view and locate north; mark the sweep of the sun’s path for heat and warmth as a positive or a negative. Depending upon your location, label the climate and site needs of your house. Consider in, on, and above ground location. Note size and orientation of windows. Note type of roof and the weather it is trying to mediate. Get situated! Planting deciduous trees on the east and west sides of a building provide light filtering, or shading, in the hot summer. As leaves fall they let in warm winter light. Evergreen trees planted in rows on the side of houses where winter wind blows help to protect entrances. Planting shrubs and perennial plants provide deep roots for absorbing water and diminishing water runoff. Plants, shrubs, and trees provide shade and cool areas as well as help to moisten and clean the air. Vegetable gardens and orchards can help supply homeowners with needed food. Make another copy of your house and note where you have trees, plants and shrubs planted. A green home is insulated against cold and hot climates. It has insulation, or thermal material, in its roof, walls, floors and attics. The insulation protects the inside from the outside temperature difference. The colder the climate the higher R value (or thermal resistance) that is needed. 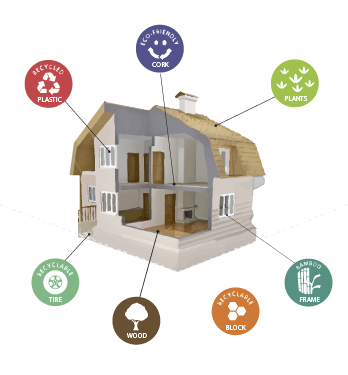 Insulation provides an R value for roofs, walls, floors and attics. Whether it is fiberglass batt insulation or spray foam insulation, it traps tiny air pockets that slow the transfer of temperature. Foam board insulation thickens the mass of material slowing temperature movement. High performance windows, or windows that have two or three sealed layers (called double or triple glazed) lose less heat than single pane windows and provide R values of 1-12.5. In cold weather, window blankets help to keep cold temperatures from transmitting. 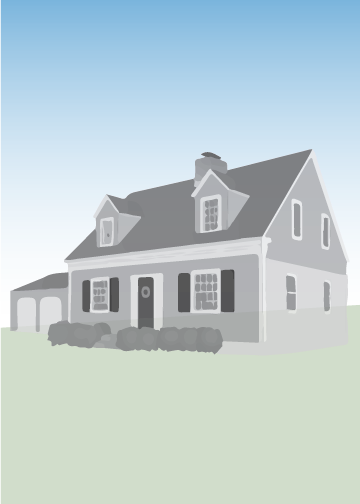 Check out R Value Calculators for recommendations for your house- Insulation Calculator or Insulate Fact Sheet by ZipCode. Take pictures of the insulation installed in your own home to see where thermal resistance is being employed. On a picture of your house, label the R value it needs in the roof, walls, floors and basement. Space in green homes optimizes interior space so that the building size is conservative and efficient. The more compact the footprint of a building, the more energy efficient the building will be. The more land the building covers, the longer the distance energy, air, and water must travel. The larger the home, the more cubic footage must be heated and/or cooled. After a green home is built, occupying it with reused, recycled, and renewable materials is important. Embodied energy means the total amount of energy used to extract, transport, produce, install and maintain a material over its life. This embodied energy concerns the lifecycle of the material as well. Green materials are materials that do not off gas VOCs nor have high amounts of embodied energies. VOC stands for volatile organic compounds which off gas from materials with chemicals and polymers (or plastic). VOCs contribute to poor and often dangerous indoor air quality. Materials found in nature do not off gas. Green materials are also materials that can be replenished and/or reused. Take an inventory of the green materials in your home and the materials that are nonrenewable and toxic. How does your house fare? Green homes activate and use passive systems first, then active systems second. 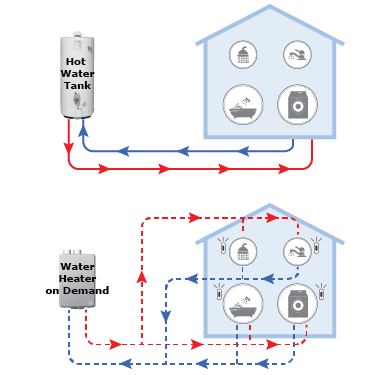 Passive systems are those air, water, energy cycles provided by location and climate. Active systems are those connected to technology. As things are placed in the home, see how many require and use energy. 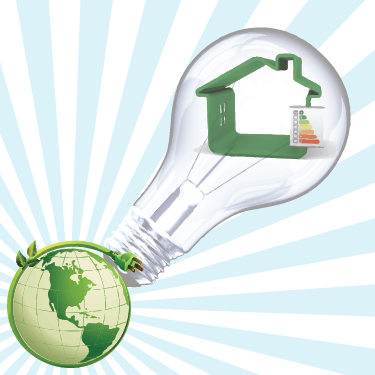 Take an energy audit and see if heating/cooling/lighting or appliances use the most energy. Find ways to conserve energy use. Take a look at the Black Balloon movie to see where to look for energy usage in your home. Consider energy efficient appliances that use less energy. Check out appliances at EnergyStar. Make a list of energy saving activities you can do to save energy in your house. Video Passive House in 90 seconds!